MasterCard is holding up well as the stock market is in a fierce selloff. The downside of that is the stock’s not on sale at this time, and I would like it to fall further before buy in. The strong dollar is hurting results. Sales rose just 1% last qtr, adjusted for currency growth would have been 8%. MasterCard also has to give out rebates and incentives to get new business, and these usually occur in the early qtrs of the deal, and thus hurt profits. Profit growth the last 2 qtrs was 6% and 5%, with the next 2 qtrs estimated to be just 3% and 6%. Additionally, profit estimates have declined each qtr during the last year (2016’s from $4.19 to $3.88) thus the stock doesn’t have momentum. 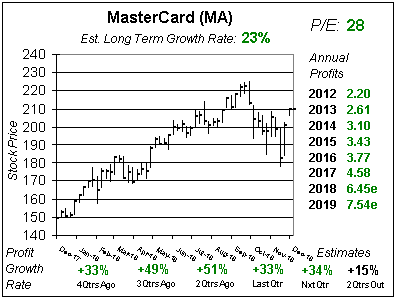 MasterCard is a relatively safe stock with an estimated 16% long-term growth rate but right now profits are growing around 5% a qtr (with estimates declining) and I don’t see the stock surging higher with a P/E of 23, so I’ll keep it on my radar for now. The company has a $4 billion share buyback program in place, which would be 4% of its shares, and pays a 1% dividend to investors. Profit growth was just 5% last qtr on a 1% increase in sales. I mentioned MA was lowering estimates. Next qtr’s est just fell from 12% to 3% and was 22% a couple qtrs before that. 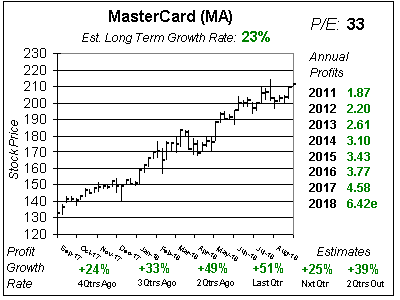 MA is a quality company, and deserves a P/E higher than its growth rate. In the past management has stated it will hit 20% earnings growth long-term. Lately the strong dollar has put those plans on hold. Still, the company has grown 15% to 20% on a regular basis — without a down year — thus I feel MA is worth 25x earnings. Right now the stock seems slightly undervalued, and has great upside to my 2017 Fair Value, but annual profit estimates have declined 4 straight qtrs and I feel that trend will continue, thus my Fair Values could follow suit. MasterCard is a core stock holding for investors who desire growth with good degree of safety. It has an estimated long term growth rate of 16%, pays a 1% dividend, and MA has grown steadily since it went public — with profits up every year. But right now profit growth is in the mid-single digits there are better values in a stock market that’s in a fierce decline. I would like to see a better price on MA before buying in.